Fortress sold 30k on first week (n°12) : http://www.antimusic.com/news/13/Octobe ... lbum.shtml. What does SPS mean? Did Fortress sale 30k SPS+album combined? Just bought another 2 copies on amazon UK, it's number 1 ahead of green day on the main album charts!! We need to get number 1 on the official U.K. Album chart!! @Mr. Slash : SPS includes streaming. Arbitrary and ridiculous way to boost sales, IMHO. So, this is AB's least selling album ever? austin. wrote: So, this is AB's least selling album ever? Not in the UK I don't think, THL will be their best ever in the official charts anyway, I'm sure fortress was 6th. Hm, I thought this album would have been the breakthrough for AB. Well, we will see how it will do in Europe. ABIII didn't do pretty well in the USA aswell and was on the other hand a little breakthrough for AB in Europe. Well, the band kinda disappeared in the last album cycle. They barely toured in America for Fortress. And they weren't together during last year's festivals in Europe. None of their songs are breakthrough remarkable for masses, AB is more of a cult thing: people will learn about them in different outlets and then start following them. A lot of that has more to do with the industry than it does AB. Official Album Charts Update Top 100 in the UK. AB on spot nr. 2 behind Green Day!!! It was number 2 in the itunes charts as well. I think this album is a success already. Thomz87 wrote: Official Album Charts Update Top 100 in the UK. Wait, is it just the rock charts in the UK or overall? If overall, that's a huge bump in the charts for AB there. Might not stay there for the final standings as we tend to pre-order, but fingers crossed. Now, does it state actual numbers sold? 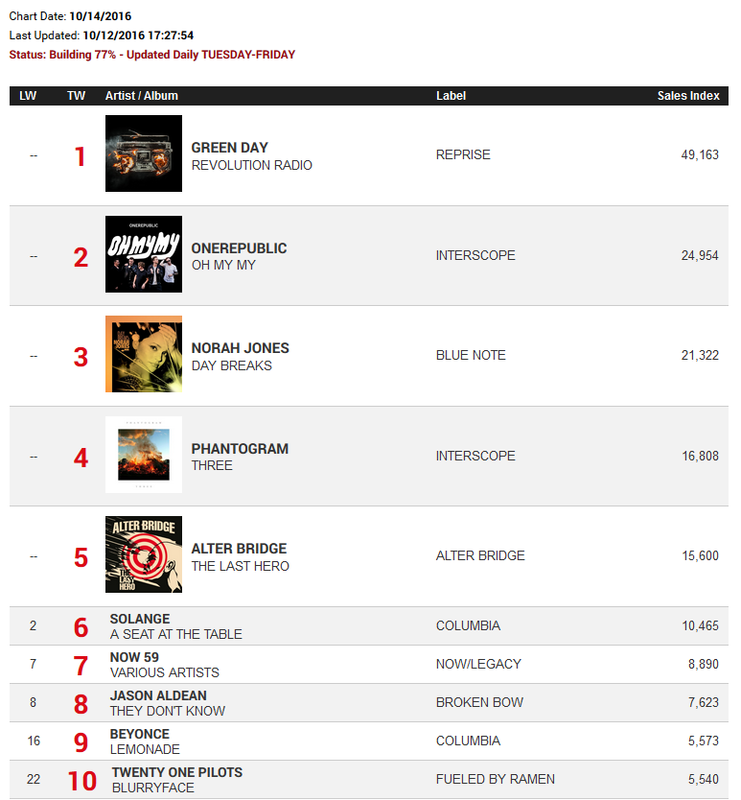 Right now, Alter Bridge is n°5 on the Billboard 200 charts, but the numbers aren't final. #5 would be the best position in the US charts since One Day Remains which also charted on #5. Kinda weird since sold units are the lowest according to that source you posted before. And this source says only 15k? I'm confused. The week's not over yet. For all we know, they could magically sell another 10-15k to reach a respectable level in a few days. 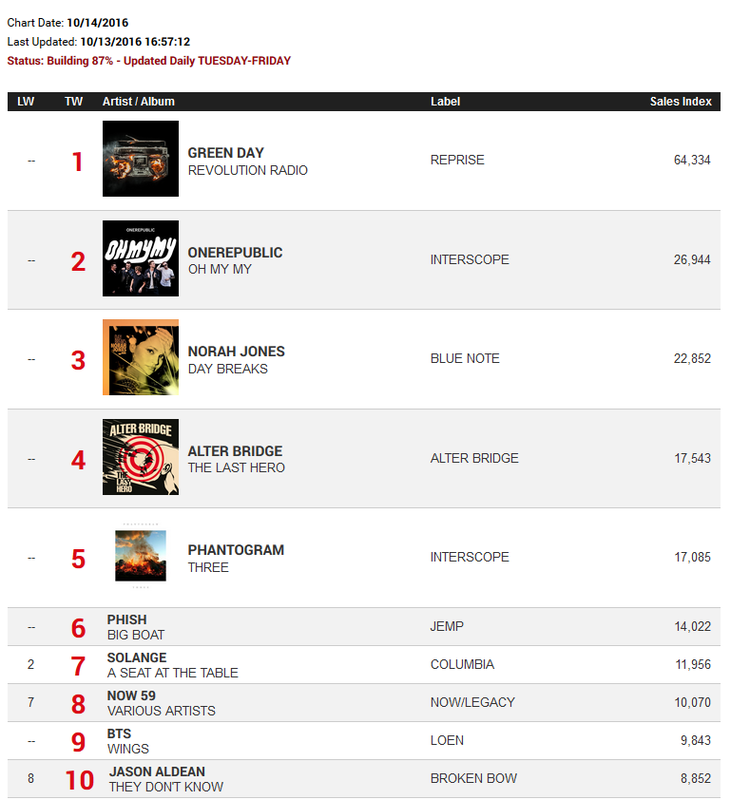 To show that AB's numbers is not the only one that is shockingly low, Green Day's number, about 50k, is pretty low for a band of their status and the fact that this is their first album in four years. However, as I stated, the week is not over yet. Mr. 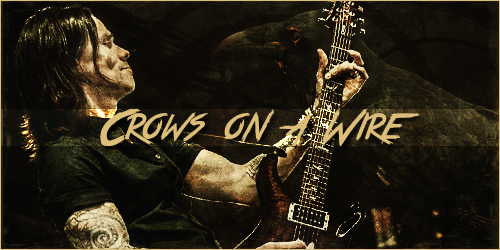 Slash wrote: #5 would be the best position in the US charts since One Day Remains which also charted on #5. Kinda weird since sold units are the lowest according to that source you posted before. And this source says only 15k? I'm confused. People don't buy music like they did in 2004. Streaming and piracy and whatnot.